Neighborhood markets have long offered good food fast – and at Anania's, the selection is big and the prices reasonable. Thank goodness for Maine’s neighborhood markets. When you want fast food that isn’t the classic chain version of fast food, you can usually depend on the local corner market for a good Maine Italian sandwich, a slice of pizza or a meatball sub. It’s sort of a Maine tradition for corner markets to have good food. Anania’s on Broadway in South Portland. 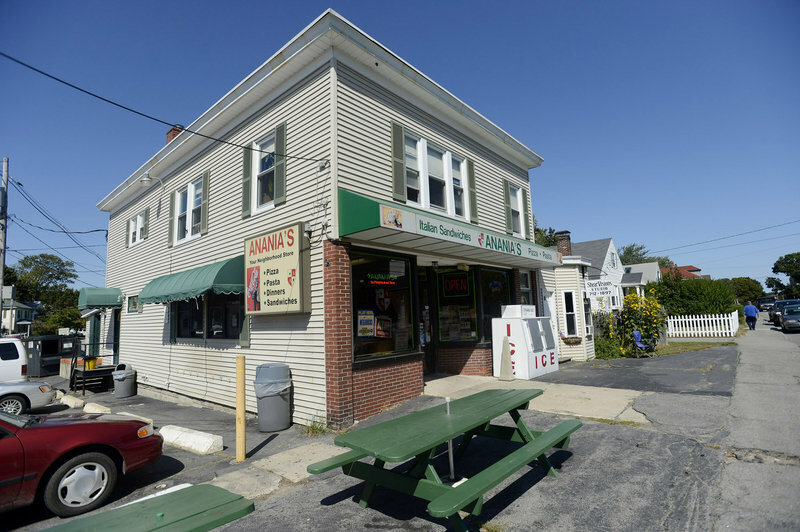 Anania’s on Broadway in South Portland has all the classic treats mentioned above, plus the added attraction of being just a short drive or walk from waterfront attractions such as Bug Light Park, Willard Beach and the shoreline path that runs between them. So if you’re looking to pick up a quick picnic lunch on the way to those places, Anania’s is a good choice. If you’re just in the mood for a quick, inexpensive lunch, Anania’s can fill that bill too. On a recent lunch break, I called ahead to order a chicken Parmesan sandwich ($7.49 for a large). I had been hankering for chicken Parm for a while, so when I saw it on Anania’s online menu (ananiasvariety.com), I had to get one. I’m glad I ordered ahead, because when I got there, the place was pretty busy. There were lots of young people about, probably students from nearby Southern Maine Community College. I took my sandwich and one of Anania’s homemade whoopie pies ($1.85) and sat at one of the picnic tables on the sidewalk. The chicken Parm had tender strips of lightly breaded white chicken meat in a tangy red sauce with a layer of melted cheese. The bread was soft and slightly toasted on the bottom, so it soaked up the sauce but didn’t get soggy. The sandwich was large and packed with meat, and was probably more than I should have eaten for lunch. But like I said, I had a hankering. At home that night, I had the whoopie pie. It was one of the best I have ever had, with a cake that had a nice cocoa flavor and wasn’t too dry or too moist. The cream was just right too, unlike some whoopie pies that taste like their filling is just Crisco and sugar. Anania’s has a big menu for a variety store. There are a dozen or so items under the Italian sandwiches and subs heading, plus a similar number in the deli sandwiches and hot sandwiches categories. The Italians range from $3.49 for a small regular to $6.99 for a large with turkey or roast beef. The hot sandwiches include meatball, hot pastrami, cheese steak, barbecue pork, buffalo chicken and, of course, chicken Parmesan. The large sizes range in price from about $5.89 to about $7.89. There are also fried foods such as chicken tenders and clam cakes, salads, tortilla wraps, pizza, calzones, dinners, buckets of pasta and breakfast items, including sandwiches, wraps and pizza. One of the breakfast items that caught my eye was the Italian-style breakfast sandwich ($3.49), with egg, peppers and Italian sausage on Italian bread. For sweets, Anania’s makes its own whoopie pies, cookies, turnovers and chocolate chip cookie pies. The other nice thing about Anania’s is that there are two more in Portland, on Washington Avenue and outer Congress Street. The staff of GO anonymously samples meals for about $10.